Here’s a thought—Margaret tells me Ganseys.com has just passed 200 posts (this is number 201). Which—taking into account breaks for holidays, nervous prostration, etc.—means we’ve been going for nearly six years. Six years! No wonder I’m feeling old. Back then I was a mere stripling, still had my own hair and didn’t have to walk round with the neighbour’s cat velcroed to my scalp (honestly: do you think anyone can tell?). It’s been a beautiful weekend in Caithness, crisp autumn sunshine and blue skies, but with that bite in the wind that tells you the equinox is past and the winter dark is coming with all the grim inevitability of a dental appointment. 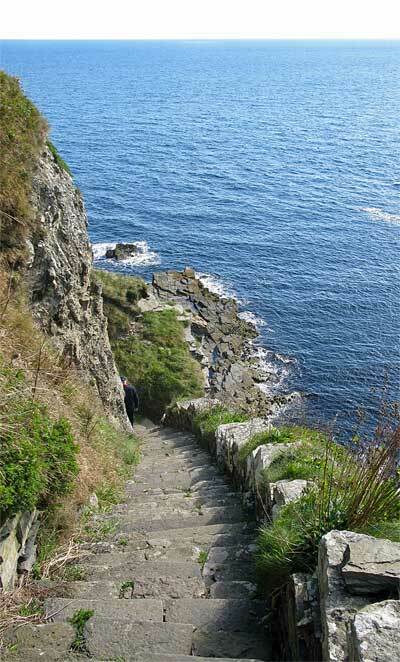 So we went to the Whaligoe Steps. 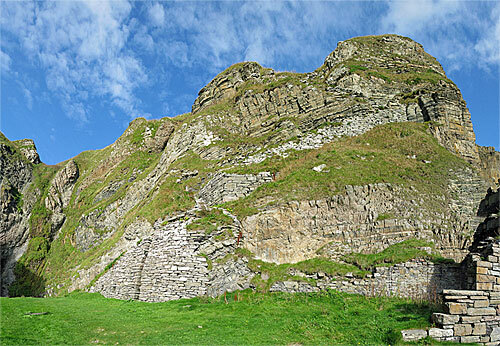 The steps start at bottom left and zigzag up to the top. Part of the salt-house can been on the right. Whaligoe is a natural harbour just a few miles south of Wick, a narrow cleft cut out of the coast like the first slice from a cake. 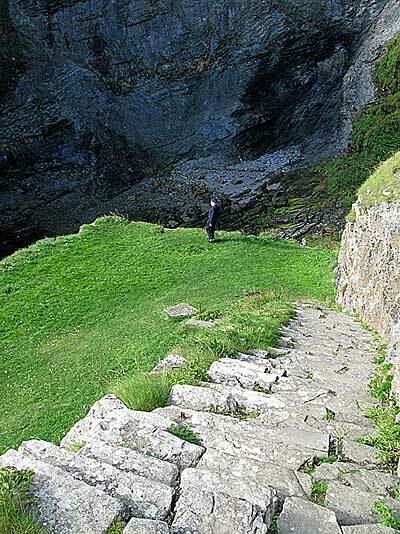 It’s not very accessible; basically, you look down on the bay from the cliffs, a drop as sheer as a four-storey office block. But harbours are pretty rare along here, and you have to make the most of what you’ve got, so a couple of hundred years ago over 300 stone steps were laid in a zig-zag all the way down to the bottom of the cliff, where an artificial grassy area (“the size of a tennis court”, as the guide books say) was laid, called the Bink. 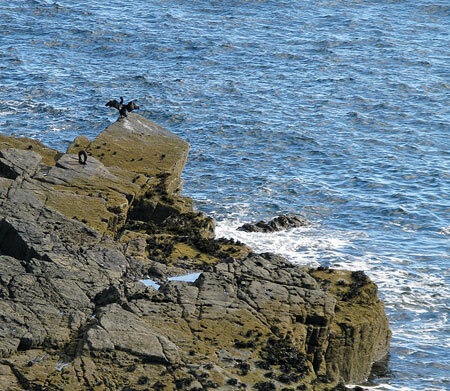 Cormorant on Muckle Loups and, slightly below and to the left, a mooring ring. On the way down the steps. Gordon is mid-picture, disappearing around the curve of the steps. Hard to imagine now, but at one time it would have been full of activity and bustle. Now it’s just another monument of weathered stone, deserted as a ruined medieval monastery, with that same sense of sadness and stillness; the only life, the bright mustard-coloured lichen on the sea-facing rocks and the odd German Stuka pilot reincarnated as a seagull. So Whaligoe is worth a visit next time you’re passing. And—how civilised is this?—there’s now a cafe-restaurant on top of the cliffs overlooking the ocean. So you can slog all the way down and back up, and treat yourself to a very nice coffee and piece of cake without feeling guilty, because you’ve (probably) earned it. Gordon on the Bink, showing the bottom of the steps. The Neist is in the background. In gansey news, I have finished the garter stitch welt and the inch of plain knitting that tops it, and have started the pattern for the body (albeit only just). Because I’ve run on so much about the dear old Steps, I’m afraid I don’t have space here to give you the pattern charts—they’ll have to wait for next week (ain’t I a tease?). But as you can see each side of the gansey will be divided into seven panels, each twenty-five stitches wide. Each panel is separated from its neighbour by a two-stitch cable (cabled every sixth row), flanked on each side by two purl stitches. The panels will alternate an open moss-stitch diamond and a zig-zag (although I still have an open mind about the zig-zag). Much more on this next week. So there we are. As some of you will remember, I gave up chocolate (and cheese and crisps) a couple of years ago, when the doctors checked my cholesterol and then advised me to stick to reading only short books in future—or maybe just haiku poetry—just in case… But if 200 posts isn’t a milestone worth celebrating, then I don’t know what is. We couldn’t come to read it if you didn’t write it; we would not come back if it wasn’t so witty and informative. I doubt that I would have started my sort-of-a-gansey if not for this blog, and I KNOW that I would not have finished it without the video on how to pick up stitches around the sleeve (I guess that I would have a sort-of-a-gansey vest.) As I slowly work on my pretty-nearly-the-real-thing gansey, I often refer to the how-to sections to see if I’m on the right track. Thank you, Gordon and Margaret, and a deep bow from the waist of a loyal reader. I agree with Dave, the information I’ve gleaned from your site, Gordon AND Margaret, has encouraged me to come out of my knitting “box” and experiment with my own gansey measurements and designs. And it’s much more than ganseys – your travelogs and descriptions of your new area have, more than once, sent me to Google Earth to more define locations. Thank you ever so much for giving us a reason to look forward to Mondays, sharing your books, giving us great belly laughs in your narrative, and – now – Caithness At War! I agree with Dave and Lynne. I look forward to your blog every Monday. Watching you work on your ganseys bit by bit helped me to make (and finish!) my son’s gansey–which he wore for the first time yesterday. Now I’m swatching for a gansey for myself. Same yarn as my son’s sweater, but coned instead of balls. I don’t know if that changes gauge, but I planned my sweater using the gauge I got before, but found I was knitting more tightly, so I had to rip it out and swatch again. So the new sweater will be based on whatever gauge I get today. Anyway, your writing is enjoyable and your pictures make me want to go see those places for myself. Well, as I always say, if I can do it, anyone can. Just don’t let them put you on Lipitor; being on it is strongly associated with adult-onset diabetes among people of my acquaintance. Everyone’s metabolism is different, of course. Still, one friend of mine went off it and onto Chinese herbs, which not only work much better for him, they also don’t interfere with his having an occasional beer. Many thanks for the last post. I enjoyed the scenery of old culture and scottish nature. As to the blog I am very happy every Monday reading it. As I am probably the only one in this group whose mothertongue is not English I also enjoy your style and the English language. Not to speak about the ”gansy”. Here in Finland we have good experiences with this, combined with diet. The spread is more difficult to use as the drinks, you need only one drink daily. Good luck with Benecol :). Well, I’ve been hanging around here for a while and still keep coming back, so it must be worth reading. (But I do wish you’d change the quote on the top – it wasn’t movie-Aragorn whose quote you’ve semi-appropriated, but movie-Haldir. Not that I’m the slightest bit geeky about such things….) And I must get on my gansey now. And thanks – but prepare to be out-geeked! The quote is by Aragorn in the book, but they gave the line to Haldir in the film. Heard a radio feature this morning on eating healthily, and someone described a Scotch egg (a hard-boiled egg wrapped in sausagemeat and deep-fried)as a “fat man’s apple”! Love to start my week with your blog, Gordon. I’m a knitter living midst the cornfields of western Iowa. Not only do I enjoy reading about your gansey projects; but I love your tales about the Scottish countryside. My great-grandmother was a red-headed Scotswoman from Glasgow. Your stories bring her closer to me. Thank you so much. Wow, Gordon, that’s a LOT of posts! I’m really impressed. I agree with everyone else, though: we come here for your delightful prose, interesting pictures, lovely knitting and biting wit. I’ve been every so slowly inching my way towards knitting my own gansey and your pictures and guidance are invaluable. And encouraging. Tamar, I’m naturally suspicious of any herbal medicine – but anything that doesn’t get in the way of the occasional beer is all right by me! 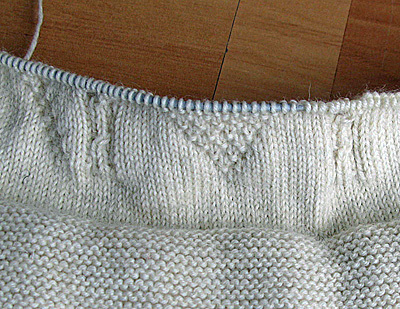 Well, it’s occurred to me over the last few months that there’s only so much you can say about knitting ganseys, which is why my blog has increasingly strayed into other territory, some of it only tangentially connected to reality. D) the meanderings about knitting and ganseys. Anything else you want to add will be gratefully appreciated. Your blog is a bright sparkle in the Internet ether and like the others I look forward to it very much. Many have already expressed my thoughts exactly. I am lucky to have discovered your site. I, too, google-earth your adventure locations with envy. 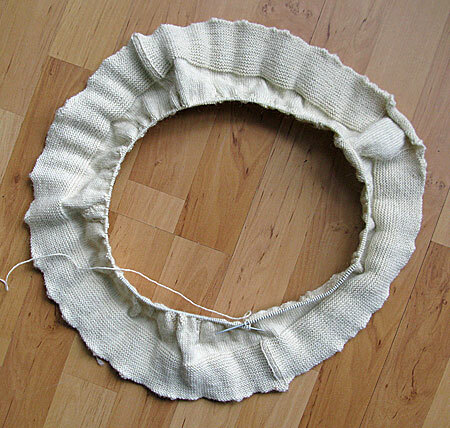 I am inspired by your beautiful knitting – it’s very encouraging to follow a project. Keep going! Scotch eggs. I cooked in a pub/restaurant and the British owner insisted on shipping them from the UK for his plowman’s triple by-pass lunch. Very nice, but maybe twice a year. Pints all year, of course. Thank you for the kind words. Bob Dylan said once, when an interviewer asked him why he didn’t bring out as many albums as he used to, “sometimes you feel like you’ve written enough songs”. After 200 posts—and Margaret tells me we first started this blog back in 2004, though it obviously looked very different then—I sort of know what he means! I need to knit to help me relax and keep my hands busy; and if I can’t write I’m forced to realise how appalling television is nowadays (God help us when we run out of NCIS box sets). When I was writing for myself and only a few people logged in it was easy. But I’m aware how easy it would be to turn into a sort of pastiche/parody of myself, and that’s what worries me. No matter. So long as I have something to say, I’ll keep on saying it. That should get me to Christmas, anyway!